Another new series for you! Flashback Fridays. Matching card and gift made easy. Hogs and Kisses--You make me happy. Welcome to Friday! Which means Flashback Friday here on my blog. 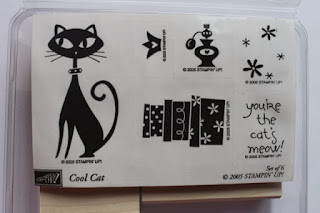 I reached into one of my bins of stamps and pulled out a set to create with. Today's set is called Cool Cat. I recall a lot of fun cat cards with this set. I am also trying to use up some of these retiring colors. I seem to have a lot of Peek a Boo Peach. So be ready to see many projects using it, lol. 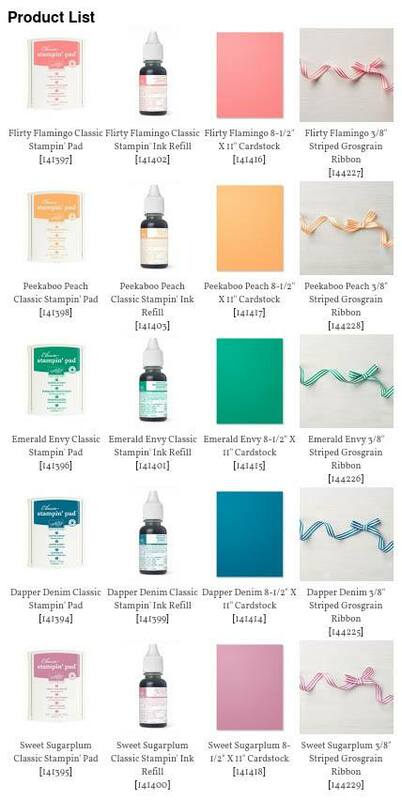 Here are the colors that will be retiring soon. You might want to be sure you are stocked up on all the ones you love before they are gone. Plus don't forget--today and tomorrow are the last days of Sale-a-bration. Enjoy your day today! See you soon. Some days I can create five cards in less than an hour start to finish--designing one right after the other without much thought at all! But then there are the days like last night. Three hours in my studio and only two designs. Both of them taking more changes that I can even remember! The really funny thing is the results ended being pretty simple cards. 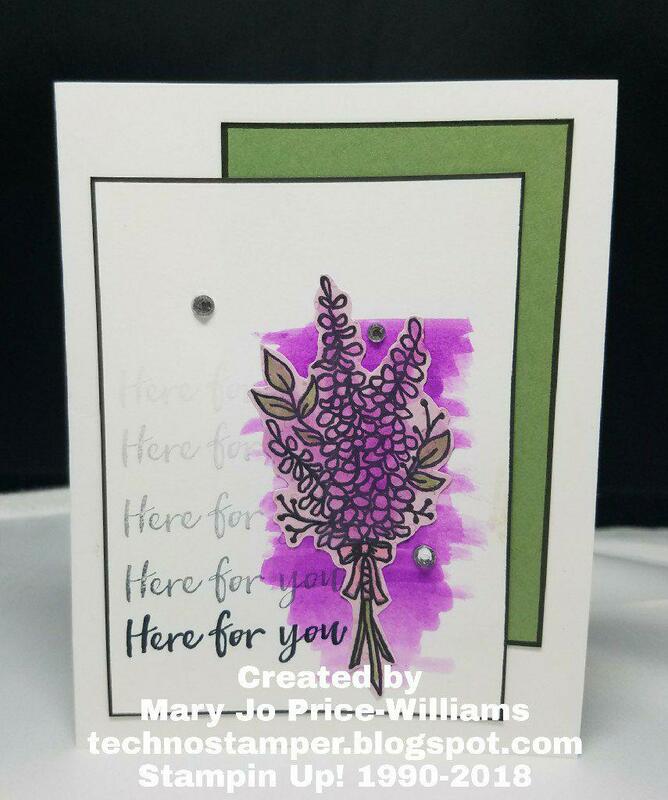 So I wanted to make one more card with this awesome Lots of Lavender set--Only three more day to get this set! This card actually started out as a quick note card. One of the small ones we sell in the catalog. These are so cute and at a great price--heavy weight card stock in a cute 5" x 3-1/2" size with envelopes. I love this brush! 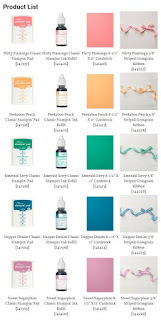 It is so perfect for adding a little sparkle to your projects. But on this one--it was NOT what I was looking for--another fail. At this point I was considering trashing the whole thing--but I hate to do that--I am determined to keep working it. So next I stamped the sentiment (from Blossoming Basket set) repeatedly along the side of flowers to maybe draw the eye from the flower a bit and make it feel like it was supposed to be subtle. That just made the wash stand out even more....uggggghhhhh. Finally I stamped the flowers again on a piece of designer paper that was laying on my table from another project--cut it out and added a bit more wash of ink on it but much lighter. I fussy cut this floral image out and glued it over the original one and it finally was something I might be able to work with! Now it has to be made into a full size card and I am getting a bit lazy--ha! So the rest of the card was finished off with whatever was in reach of my seat--the Wild Wasabi piece was sitting in the pile of scrap right next to me from another project and it already had the black line around it with my black pen so I grabbed it and put it behind the image panel. Now the image panel needs to be black lined to match, right?! Easy fix as that black pen is always with in reach as it is something I do on most cards at least once. Kind of a signature thing, lol. (along with those rhinestones that seem to find their way onto most of my designs) Finally I decided to go with a Whisper White base as that was the original feel I wanted with the note card. Phew---that was a lot to go through for one pretty simple card--after that I decided to come upstairs and enjoy a glass a wine and give it a break for the evening. Here are the supplies used on this card. 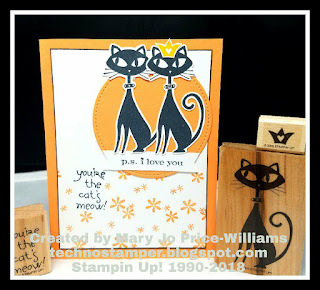 Minus the Wink of Stella and Note cards as they are not really relevant in the final design!